Text: Sources. 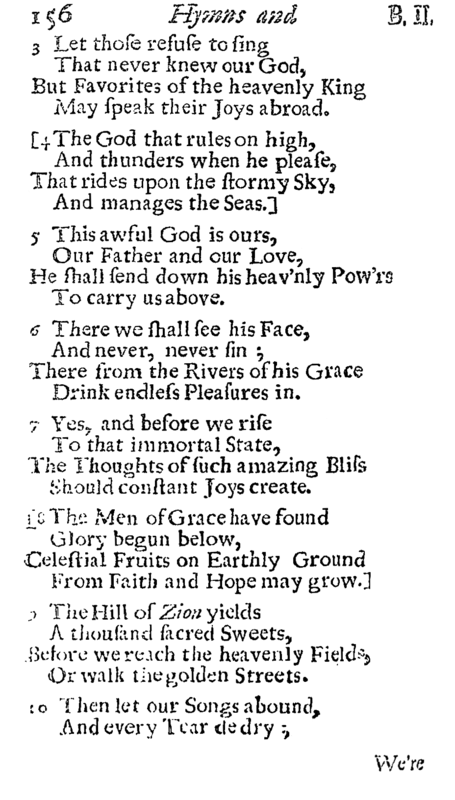 This hymn by Isaac Watts (1674-1748) was first published in his Hymns and Spiritual Songs (1707 | Fig. 1), in ten stanzas of four lines, without music, and headed “Heavenly joy on earth.” In the second edition (1709), he revised stanzas eight and ten (Fig. 2). Fig. 1. Isaac Watts, Hymns and Spiritual Songs (1707). Fig. 2. Isaac Watts, Hymns and Spiritual Songs, 2nd edition (1709). Text: Analysis. Although the title describes a hymn about earthly joys, only some of the stanzas speak about earthly worship gatherings, while the remainder of the hymn looks forward to celestial worship. Watts looks to the latter to inspire the former. The first stanza is a call to worship, thus this hymn is often used in that regard. The second stanza seems to respond to an ideology or complaint that sees religion as a barrier to earthly pleasure. Stanza four reflects biblical language of God’s power over creation that can be found in places like Psalm 104, Psalm 107, or Job 38, and it references storm and sea, like many other great hymns such as “Eternal Father, strong to save,” or “We'll understand it better by and by.” The rest of the hymn describes features of heaven, although stanzas seven and eight describe how the promise of heaven should provide seeds of joy during the present state. Zion is the name of the hill in Jerusalem on which the temple stood, but it also refers to the heavenly Jerusalem (Heb. 12:22, Rev. 14:1). A modern worshiper singing about a hill with “a thousand sacred sweets” might conjure images of Willy Wonka’s Chocolate Factory, but Watts likely had other treasures in mind. The final stanza calls on worshipers to put away sadness and march in confidence toward greater things above. As with all of Watts’ hymns, the brackets indicate which stanzas should be omitted if the hymn is deemed to be too long to sing or print as a whole. Text: Development. 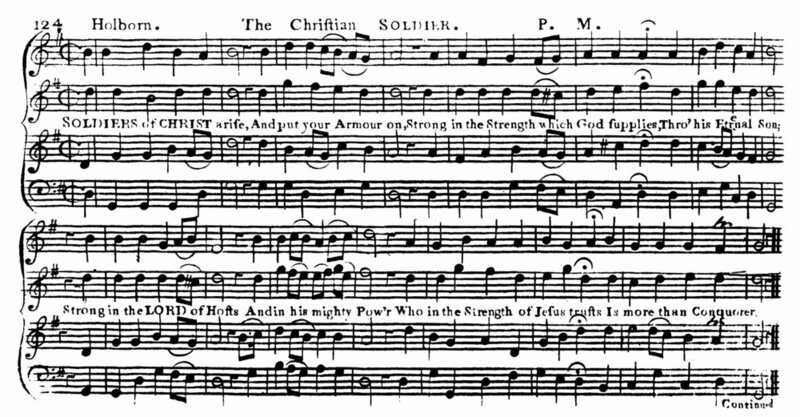 One notable variant of the text is from the editorial hand of John Wesley (1703-1791), who altered the text for his Collection of Psalms and Hymns (Charlestown, 1737), omitting stanzas two and nine, and changing the opening stanza from first person plural (“we”) to second person plural (“ye”). This was repeated, with minor revisions, in A Collection of Hymns for the Use of the People Called Methodists (1780 | Fig. 3), and from there it was accepted into many Methodist collections in preference over Watts’ original text. Fig. 3. A Collection of Hymns for the Use of the People Called Methodists, ed. John Wesley (1780). Another long-standing variant, changing “favorites of the heavenly King” to “children of the heavenly King,” seems to have started with Psalms and Hymns for Public, Social, and Private Worship, Prepared for the Use of the Baptist Denomination (London, 1857). Tune. The hymn initially appeared with a multitude of tunes, with little agreement between collections and tune books. In the United States, the most popular setting has been MARCHING TO ZION, written by Robert Lowry (1826-1899), first published in The Victory (1869 | Fig. 4). It did not appear in his collection Silver Spray (1868), as is often reported in other hymnological commentaries. The original arrangement was written in four parts, with the melody in the second part. Lowry created a chorus, drawing words from Watts’ final two stanzas. Fig. 4. The Victory, Chester Allen & William Sherwin, eds. (NY: Biglow & Main, 1869), melody in the second part. Fig. 5. Aaron Williams, The Universal Psalmodist, 2nd ed., corrected (1764). In 1770, Williams shortened the tune and renamed it ST. THOMAS’S for his New Universal Psalmodist (1770 | Fig. 6), where it was set to Isaac Watts’ paraphrase of Psalm 48, “Great is the Lord our God.” Williams may have either given this shortened tune idea to or taken it from Thomas Knibb’s The Psalm Singers Help (ca. 1769). Knibb had paired it with another Watts paraphrase, “Behold the lofty sky,” from Psalm 19. Fig. 6. Aaron Williams, New Universal Psalmodist, 6th ed. (ca. 1775). ST. THOMAS has proven to be more enduring and more useful than HOLBORN. It is known to many worshipers via the hymn “I love thy kingdom, Lord” by Timothy Dwight (1752-1817), and can be found set to many other texts. The connection between this tune and “Come, we that love the Lord” seems to have started with John Cole’s The Beauties of Psalmody, 2nd ed. (1805), a connection that has now lasted over 200 years.